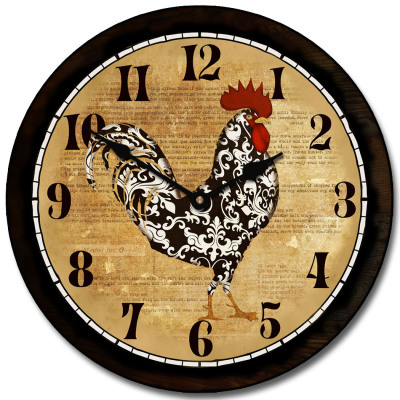 A decorative Rooster Clock in black and white on a parchment newspaper background makes this clock extra special great for kitchen or dining area. 1/2" thick MDF wood base, (industry standard is 1/4") this clock can be gently cleaned. The clock hands may varydue to size and availability. Runs on a quiet Quartz movement, One AA battery required. Made when ordered please allow a full 4-10 business days before shipping.